Roald Dahl books seem to be perfect for the big screen. They are stories which are rich in imaginative, creative and astonishing tales, filled with moments which delight and disgust in equal measure. 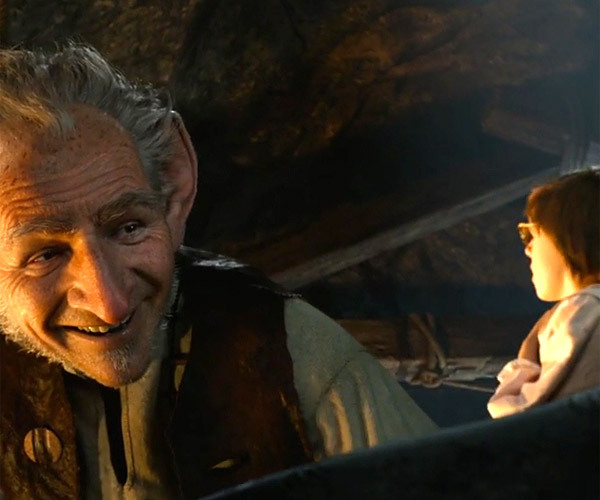 Some have managed the transition very successfully, from Willy Wonka and the Chocolate Factory to The Witches and there is no reason The BFG couldn’t have done the same, especially with Steven Spielberg at the helm. Unfortunately, something is lost in the translation. The BFG doesn’t feel like the magical, imaginative tale which Roald Dahl crafted. It is difficult to explain why but there is definitely something very “matter-of-fact” about the way the story is told. Roald Dahl’s stories focus on a child, amazed and awed by the new experience. The perfect example is the moment the children enter the factory floor of Willy Wonka’s Chocolate factory. There isn’t any of that in The BFG. This is the fault of the movie because the book does have this. This is a world where giants exist but most of them eat children. One particular giant collects and creates dreams and rather than eat children, eats a disgusting vegetable called, in classic Roald Dahl fashion, a snozcumber. This is all ripe for development but seems glossed over very quickly, with the audience’s eyes, young girl Sophie, not particularly amazed or shocked by any of it. Roald Dahl’s magic is because of his creativity with words and building worlds but Spielberg relies too much on the audience to see the world, rather than have the characters experience it first-hand. Not there is anything wrong with the world that Spielberg creates. The effects are incredible and the little nuisances and details within the house of The BFG are very clever. The world of dreams is as close to the Dahl magic as you’ll get but the actual characters themselves are where the triumph lies. Mark Rylance is fantastic as The BFG and the way he muddles up his words, uses the wrong phrases and very kindly misses the point is all brought to life perfectly. The fact that the technology seems to effortlessly and seamlessly graft Rylance’s face onto The BFG’s adds to the effect of the character. The same can be said for the villains. Not enough time is spent with each individual, evil giant but their leader, the Fleshlumpeater (another Roald Dahl classic) is brought to the screen perfectly by Flight of the Conchords’ Jemaine Clement. The weakest link in the characters is unfortunately Sophie, played by Ruby Barnhill. Her acting is very good but the way the character is written is much more irritating than you want from the central, heroic child. It means that the film struggles to bring the magical original story to life but there are moments of brilliance beneath what is an average movie. The meeting with The Queen and an experience with frobscottle will put a smile on the face of anyone in the audience, immature but perfectly pitched, no matter your age. Overall, The BFG is a rare miss for both Steven Spielberg and bringing a Roald Dahl classic to the big screen. The effects are excellent, aspects of the story are magical but the wonder and intricate detail of the book doesn’t translate and some of the awe-inspiring scenes lose their impact. It isn’t a bad kid’s movie, just an average one, which for Roald Dahl and a story this legendary, is a loss in itself. This was one of my favorites of the year. So incredible. So faithful to the book and to the ’89 made-for-British-television animated special. I do see what you’re saying about how Spielberg really rushes us into this world and doesn’t allow us much time to soak any of it in — in the ’89 film (not sure if you have seen that or not) there’s a bit more development there and I think this one could have used more of that but I think you’re a bit off when it comes to describing Sophie. She’s nothing like the irritants you get in most kids movies. She’s nowhere near as obnoxious as half of the people poor Charlie Bucket is stuck on a factory tour with. She’s nowhere close to being a bully, a brat, or brainless. I thought she was a great character brought to life perfectly by Barnhill. I guess this is a great example of how differently viewers can interpret aspects of movies as well as the movies themselves. In comparison, Sophie is one of the least obnoxious compared to the others in say, Charlie and the Chocolate Factory however compared to Charlie himself, she is a bit “know-it-all.” It is a minor issue but made an impact. Previous Previous post: Does an actor’s real-life actions affect you watching their films? Next Next post: Hitchcock Week: The Launch!